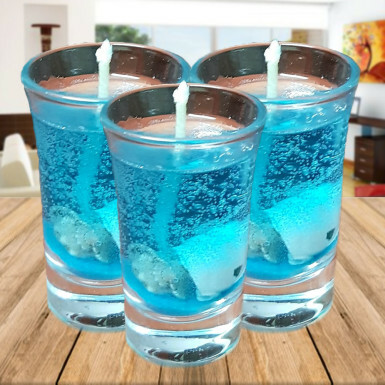 These delightfully blue colored gel based candles make up for a very sweet gift on Diwali, birthday or anniversary. You can gift them on success parties, House warming parties and promotional parties as well. They are a perfect complementary gift along with fruit baskets , Dry fruit combos and Chocolates. These cute candles look wonderful as decoration pieces, and look brilliant when lit. The gel glows when the candle is lit and creates a magical environment. Perfect for home and office decor, order now and see the magic for yourself.